The Salt Electrical Ladies of the Dirt Wingless Sprint Series got underway last Saturday night with the opening series round, presented by The Butchers Cut, at Simpson Speedway, and while Jess Moulden and Carly Walsh reigned supreme throughout the night, it was Moulden who eventually came out on top to claim the victory. With Moulden and Walsh finishing first and second and vice versa in their two heat races throughout the night, it was a close battle between the pair, but it was Walsh who was awarded the pole position start for the 15-lap feature race, by virtue of recording the faster lap in the heat races. Not to be outdone, Moulden wasted no time in rectifying her position, pipping Walsh for the lead at the drop of the green flag and going flag to flag to open her Salt Electrical Ladies of the Dirt Series winning account. Forced to settle for second place was Walsh, who will no doubt be back in victory lane in future rounds, followed by third-place finisher Renae Eastham, who had fallen victim to Bree Hall in the early stages of the race, slipping back to fourth, only to regain her position on the final lap. 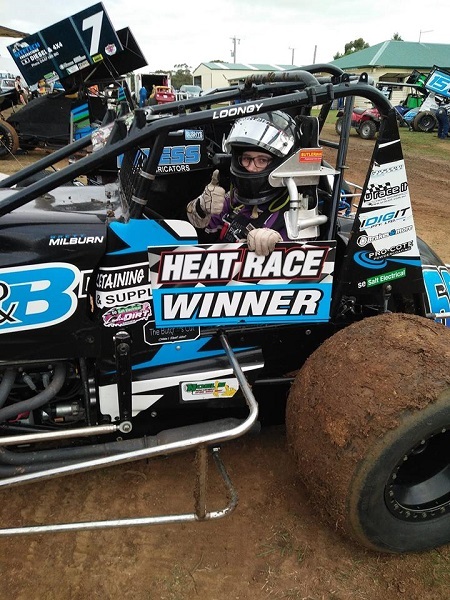 Unable to fend off Eastham in the final stages, Hall crossed the finish line in fourth place, ahead of 410 Sprintcar driver Kristy Ellis, who was piloting the Kelvin Johnson-owned Wingless Sprint. Remaining finishers were Elira Degrandi, Jade Moule, Demelza Nettlefold, Jessie Garlick and Bianca Klemm. Moulden, a former Ladies of the Dirt Series Champion, whose accolades also include winning an Australian Formula 500 Title, has proven that she’s going to be tough to be beat throughout the series aboard the Wayne Milburn Jnr-owned car. However, if anyone is up to the challenge, it’s certainly Walsh, who dominated last season’s series and will be hoping for a repeat this time around. The second round of the Salt Electrical Ladies of the Dirt Series will be held at Rosedale Speedway on Good Friday (April 19), followed by round three at Laang Speedway just over a week later on April 27. 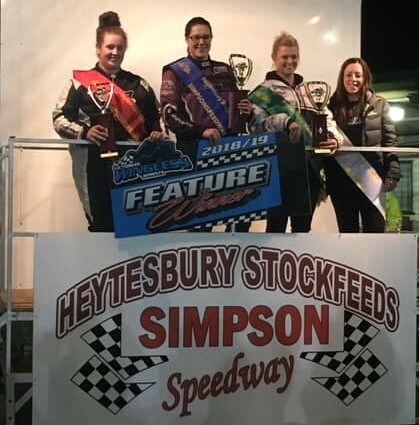 Another week later, the fourth series round will take place at Darlington’s Mid-Western Speedway, before the series concludes at Nyora Raceway on May 18. The Victorian Wingless Sprints would like to thank the naming rights sponsor of the Ladies of the Dirt Series: Salt Electrical. Established in 1954, Salt Electrical is a family-run business that is dedicated to providing prompt and professional electrician services throughout Geelong and surrounding areas. For further information, visit www.saltelectrical.com.au or call 03 5222 4222. The club would also like to thank The Butchers Cut and CR Racewear Apparel for their support of the opening Ladies of the Dirt Series round. Based in Cobden, The Butchers Cut, owned by Marlin and Caitlin Walsh, is a thriving local business that is a regular supporter of community events and other activities. Get in touch with them by calling 03 5595 2388. Owned and operated by Carol Robinson, CR Racewear Apparel is based in Warrnambool and offers a variety of ladies race wear and other apparel in a range of sizes. To find out more, send an email to chixgear-australia@hotmail.com.